Walk, run, sprint for females. Run and sprint for males. Neatly packaged in a Mod Organizer/NMM installer with lots of options. Female walk: Used an older but less horrible version. Sprint: Head and neck movements are much more pronounced now, should feel less Terminator-like now. Removed the animations for the weapons, because that's a job for HDT. Fixed a bug with an armband on some female armors (walk and sprint). Thanks to Guraka22 for letting me know about it. Female walk: Less arm sway. Sprint: Head and neck now lead the movement, should feel less stiff overall now. Fixed the blending between female walk and run (bug in 0.5/0.6). The female run can now be used on males. Added options for animations without animated weapons (e.g. for people who have their swords on the back). Improved the female walk. It's not perfect, but at least it's not horrible anymore. Added faster 2H equip animation. The animations are now working properly with an analog controller. Removed the 360 option; it's always 360 now. If you don't like it, delete the files manually please. Run: Much better spine twist, less arm movement, fixed toes, more powerful take off, secondary animation on sword, mace, skirt back, skirt front. Added the missing footstep sounds on the Sprint animation. Run: More lively shoulders. Subtle head/neck movement. Fixed pauldrons. The GIF probably plays a little too slow in the browser. Watch on Gfycat or try the video below. These animations are a by-product of my little research project to create (tools for creating) physically plausible animations. I'm a programmer, not an animator. So this whole thing is a learning process for me. I hope you're still getting something out of it. Please install with either Mod Organizer or NMM. The mod comes with an installer with lots of options. I suggest you install the mod with all animations enabled first, try it out, then reinstall again with the ones you liked. I recommend Mod Organizer, it's a really great program. I don't use NMM anymore, but I'm told that the installer works. No cloak animations? There's finally a physics based solution: Capes with HDT physics by kryptongirlkara. The sprint looks rather stupid with a shield equipped. -> Use a mod that automatically unequips the shield when you sheath your weapon. You have a custom skeleton and the torch doesn't work? -> Run FNIS with the "Skeleton Arm Fix" patch enabled. The run animation was created for normal running speed (light armor). If your heavy armor/weapon is slowing you down, the animation will look wrong. I even tried modifying the behavior files to fix this, but it's not working. This problem exists in the vanilla game and with all animation mods out there. Maybe it's just more noticeable with my mod since the focus is on being physically plausible. 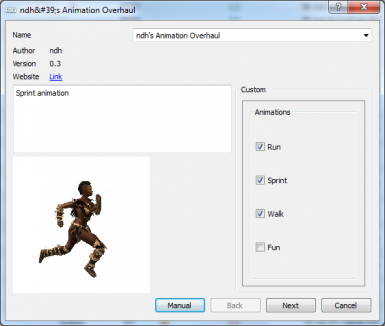 Kudos to UrShack for helping me fix the 360 animations.